Unable to activate the product. Your license has reached the activation limit. Please contact the Parallels support team for assistance. A Business Edition license is tied to the hardware it is used on at the moment of activation. If you change a Mac, you need to reset the activation that is not going to be used anymore, so that it can be used on the new hardware. Open the Active Computers page. Select the device you would like to deactivate the license on. You can select several or even all of them. 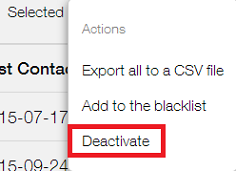 Click on Actions at the top right corner of the list to open a drop-down list with possible actions.